Jessica and I are definitely on the same organizing wavelength, because we both used the very same concept to get our drawers into tip top shape! It is such an incredible feeling when you see ideas that are working well for you, adapted by another with the same happily ever after. And that is definitely the case here. 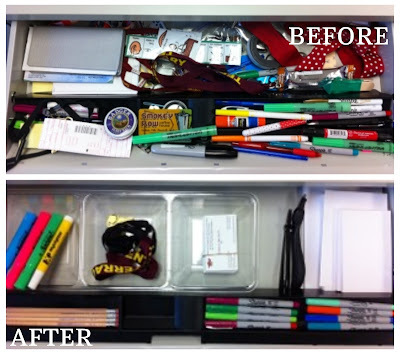 Being organized at work is just as important as being organized at home. It's hard for me to show you the difference because I work from home... but I do know first hand due to my 8+ years of office experience. That's why I am uber excited to share this Reader Space today. Because it takes place in the workplace. A place I haven't yet featured here on the blog! But the really cool thing, is that the concept and the idea of today's post, can also be implemented in the home! Love that! As a daily follower of your blog, I like to apply your tips to my home, but also to my classroom. I am an elementary art teacher. I have a blog for art teachers called "The ART of Education." A large portion of my blogging involves classroom organization. I wanted to share with you a post I did about organizing my desk drawer. I think many people think about organizing their homes, but their work life is not that organized, or the other way around! I am especially liking your "Organize in 15 Minutes" posts, which I recently commented on. Thanks for everything! At the beginning of the week, I shared with you a deep dark space in my life. 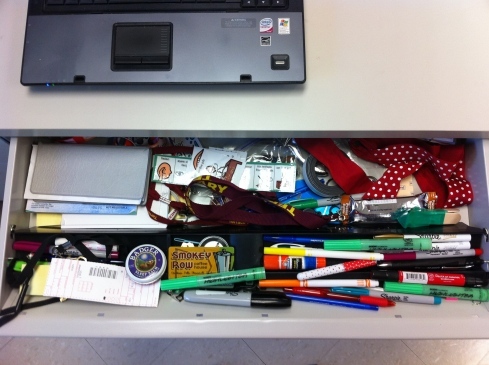 My top desk drawer. It was such a mess. I swallowed my pride and took a few photos, challenging you to organize your own drawer with me this week, in my “Tackle it Together” series. Check out that post here. I’d love to hear how you all did! And that is just to name a few! All of these things I did not use on a regular basis…. 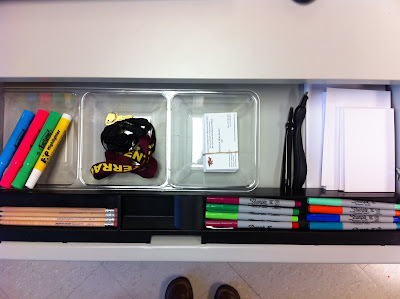 My goal for the drawer was to only put things in here I use and can grab easily EVERY DAY! Here is what I did. I started by dumping out everything on Monday. I cleared the drawer into a tub. 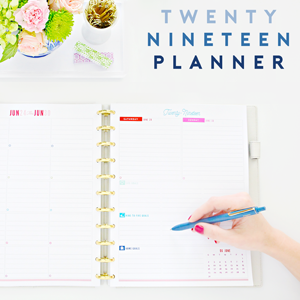 I like to start organizing projects with a fresh clean slate. I only added back in my favorite pens. As the week went on, I would only pull things from the bucket that I needed, telling me it was an item I needed on a weekly or daily basis. I would gradually add things as the week went on. It turns out I didn’t need very much of what I had pulled out. My only putting a few things back, I really simplified my life! So, what did I choose to keep in my top drawer? 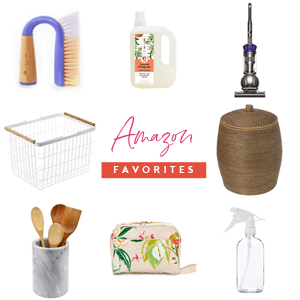 The following are the items I grab every day. Pencils – MY pencils, to keep save from the grubby hands of little kids. I hate using their pencils. I am constantly washing my hands! These are in my safe zone! 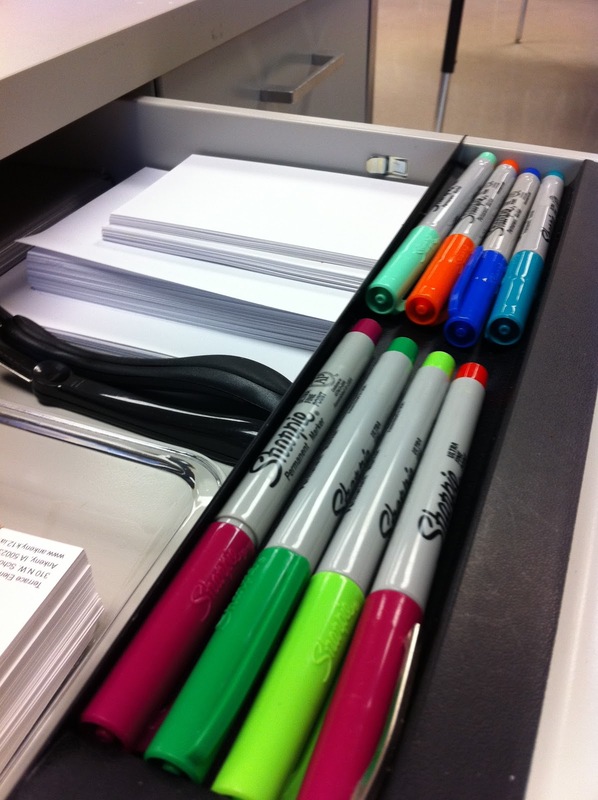 White index cards – One of the office supplies that makes me giddy. I write all of my TO DO lists on these cards. Note, three different sizes, depending on how much I have to do! Highlighters – Another love affair. I highlight things all the time! Staple Removers – for those pesky bulletin board take downs! And then, I got a little drawer organizer, which is really just a serving tray I picked up for a dollar. In this, I have my highlighters, my professional cards to hand out, and also my recess whistle and key for the kiln room. Both things I do not want to lose! Since this project was completed, it has definitely made my life easier and the system is working, which is a good sign! So, there you have it. Lets see a side by side for effect. What do you guys think!? 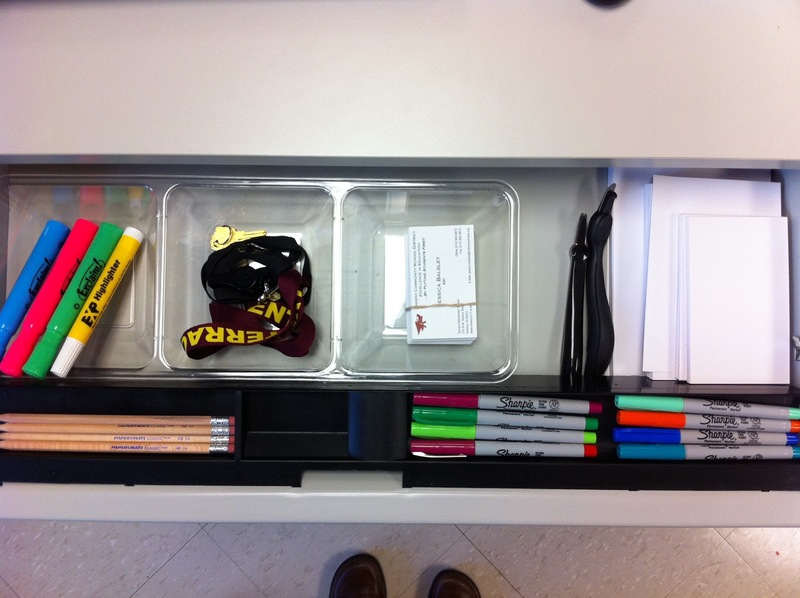 Pretty awesome way to organize right? I showed you here, how I used the same system to get my kitchen drawers in tip top shape, so now you have multiple visuals of the benefits of hopping through the same process. 1. Empty contents from drawer or other space, into a large bin. This gives you a blank slate. 2. Dedicate a realistic period of time, one to two weeks is typically best. Only place items back into your zone, that you have removed from the bin to use. 3. Assess. At the end of your dedicated time frame, you can analyze what's left in the bin that didn't get touched. Think about the whys? Does it belong in a better place to be more functional to you? Is it just taking up valuable real estate in your home/zone? Can someone else put better use to the object? 4. Toss/Sell/Donate. Determine your best method to say goodbye to the remainder of the bin contents. 5. Dance. Yep, like no one is watching. 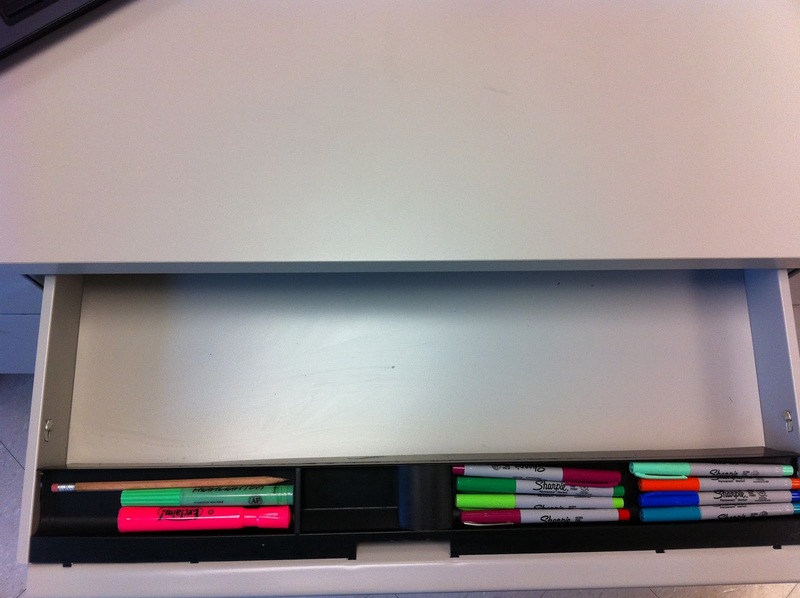 Be proud of your newly organized zone! It will function SO much better with less items weighing it down! Thank you SO much to Jessica for giving us a glimpse into her work life, and showing us the importance of looking at all aspects of our lives when it comes to organization! P.S. Have an awesome story to share? 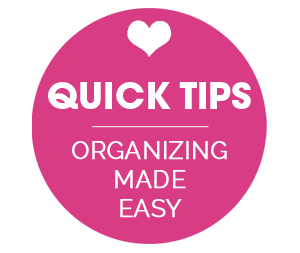 How about some organizing tips and tricks? Maybe a project completed from an inspiration found? Please send your story and photos to iheartorganizing@gmail.com and I would heart to feature them right here, on the blog!! Oh, and no worries my friends, we will NEVER judge "before" pictures because that just wouldn't be nice! Only love goes on at this blog! Great organization. Inspires me to crack open my desk at work! [lol]. I loved this post...I am in the process of organizing my "teacher corner" in my classroom too. And yes, I took pictures along the way! :-) I'll be sending them in as soon as I am done! 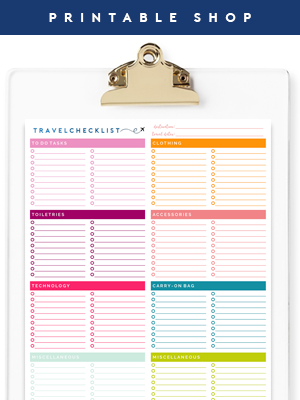 I must admit- Every since doing this project I have kept it just this way, and it has made my life so much easier!... The next thing I plan to tackle is under the sink in my art room. Now THAT will be interesting! Thanks, Jen for all of your inspiration, too. Whether we are at home or at work, being organized makes our lives easier. My girlfriend did this with her BIG drawer in her kitchen that holds the utensils. She dumped EVERYTHING into a box and for a week only put back in what she used. Just like this post! GREAT idea, would work for clothes, bathrooms etc., etc!!!! 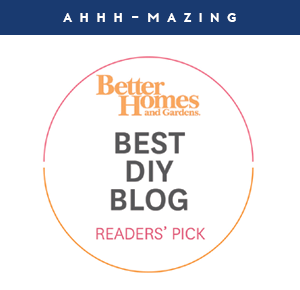 Thank you for sharing that blog! It inspired me to come to work today and do the same. I wish I would have done and B&A. It was terrible! I didn't use things over a week but instead took out office supplies, business cards and other things I knew I hadn't used and never would. I can't wait to tackle the rest of them before I leave work for Xmas break.